AUGUST MARKS THE 75th ANNIVERSARY OF THE BATTLE FOR GUADALCANAL … a major turning point in the Pacific war. On the morning of 7 August 1942, eight months to the day after the surprise Japanese attack on Pearl Harbor, the U.S. 1st Marine Division, under MGen Alexander A. Vandegrift, landed on the islands of Tulagi and Guadalcanal in the Solomon Islands. 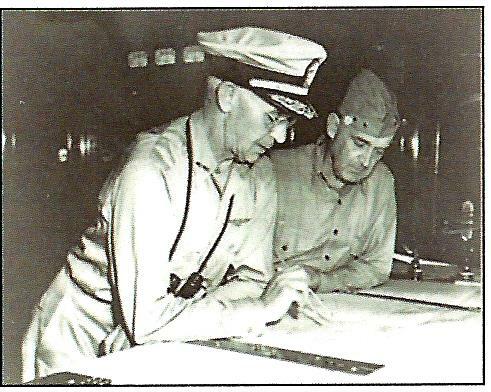 This was the beginning of the bloody and brutal six month Battle for Guadalcanal. For those who were there, Guadalcanal is not only a name; it is an emotion, recalling desperate fights in the air, furious night naval battles, frantic work at supply or construction, savage fighting in the sodden jungle, nights broken by screaming bombs, and deafening explosions of naval shells. When the battles were over in February 1943, the campaigns in the Solomon Islands had cost the Allies approximately 1,592 Marine Corps and Army lives, several score of fliers, 5,041 Navy, plus 24 ships (excluding transports and cargo ships) and 615 aircraft. In The Solomons Campaigns, 1942-1943 by William L. McGee (BMC Publications, 2001), all the campaigns — from Guadalcanal to Bougainville — are covered in concise detail, followed by an analysis of the valuable lessons learned. A limited number of first editions available on Amazon.